Few things put the final touch on a perfect day on the lake in a pontoon boat than a delicious meal cooked on the grill, on the water. Bennington Pontoon Boat owners know that if there is something you are not able to do on your boat, then it's time you found out how to do it. There are many varieties of grills that are built to function on your pontoon boat, but choosing the right one depends on a number of factors. Remember, that it is always best to consult your local Bennington Pontoon Boat dealer to find the best fit for your boat. 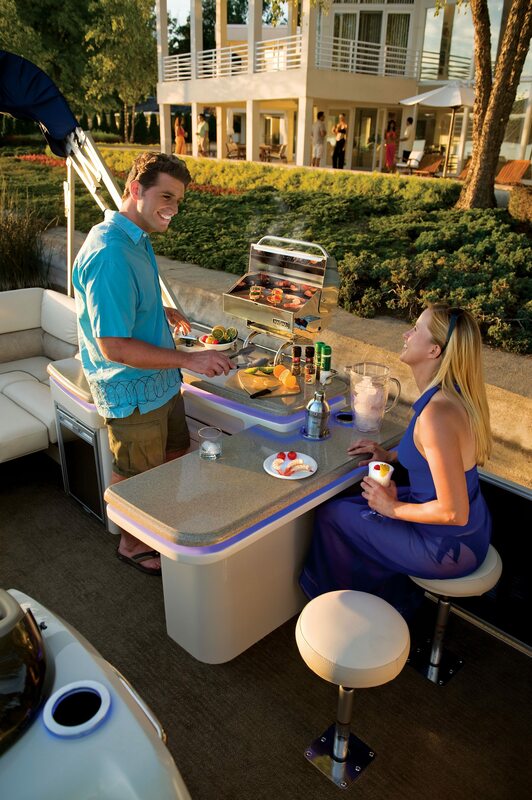 When choosing a grill for your pontoon boat, you must first decide between a charcoal or gas grill. While many sea-faring chefs believe that charcoal gives a better flavor, gas is often more convenient. Choose what works best for you. Most boat gas grills use a one-pound propane cylinder. While these are usually more than enough for a small family lunch, larger meals or foods that take longer to cook may need additional tanks. Boat grills generally come in two shapes, rectangle and circular. Rectangle grills allow for more room for food, best for large parties and families, while circular grills can double as a stove or oven and typically be rotated. Grills can also be mounted onto the side of a boat or portable. If you plan to leave your grill on the boat for an extended period of time, or boat in an area where rougher water can be expected, a mounted grill is likely your best bet. If you are bringing the grill to a beach or camp area for use off the boat, a portable grill makes more sense. Brands like Magma, Kuuma and Coleman offer fantastic solutions for a wide variety of grill styles. Finally, consider the area on the boat that is most appropriate for mounting. This is an additional subject that should be discussed with your local Bennington Pontoon Boat dealer. Be sure that the grill can be mounted out of the way of the captain as well as not to interfere with passengers or recreational activities like fishing.